I love pizza. Yum Yum Yum! 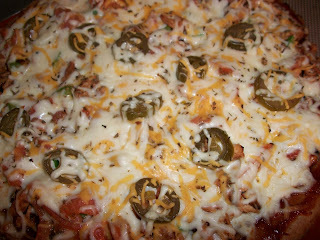 I was trying to find a Weight Watchers friendly BBQ Chicken Pizza and I found one at http://www.recipezaar.com/. This pizza is only 5 points per slice, but I am sure it could be less if you substitute the regular cheddar cheese with fat free cheddar cheese. The only problem is that fat free cheeses do not melt very well. My husband and I made this pizza and between him, myself and my mother in law, there was not even one slice left! This is a great pizza for pizza night! You can add whatever toppings you like and make it your own. We loved the sweetness of the BBQ sauce (Sweet Baby Ray's Original) with the taste of spicy jalapeno peppers. Perfect sweet and spicy goodness! Preheat the oven to 450 degrees. Dice the onion and sauté the onion with 2 of the tablespoons of BBQ sauce. Add chicken and cook until chicken is cooked through. Top your Boboli pizza with the remaining BBQ sauce, fat free cheddar, low fat mozzarella, onion chicken mixture, green pepper, tomato, jalapeno peppers, then the regular cheddar. Bake for approximately 10 minutes.